We've all been disappointed by an occasional store brand, and we are especially nervous about trusting our skin to the mysterious no-name manufacturers behind these products. "Will it make me break out? Does it smell like bug spray?" are both legitimate questions when it comes to the generic. 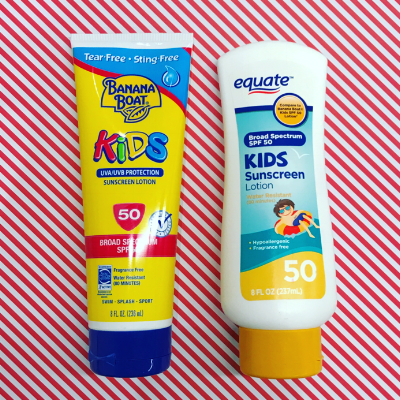 Keep reading for five sunscreens to avoid this summer season. SIMILARITY SCORE: 20%: The main drivers of this extremely low score are smell and thickness. Consumers said "Up&up smells more sunscreeny and is super watery." SIMILARITY SCORE: 27%: This dupe was dinged for consistency issues as Coppertone is much thicker. In addition, active and inactive ingredients were dissimilar. SIMILARITY SCORE: 28%: This dupe ended up in the worst category because of very different active ingredients, smell, and the fact is was more watery. While the name brand, Banana Boat uses Zinc Oxide, which is a physical block, Equate uses chemical blocks. NOT THE SAME. SIMILARITY SCORE: 38%: Don't be fooled by the similar packaging - Consumers say that the CVS version leaves you feeling greasy. SIMILARITY SCORE: 46%: While the best of the worst, this sunscreen makes the top five because consumers say it smells significantly different from the Hawaiian Tropic. Now curious about where to turn for trustworthy dupes? Check out our top five drugstore sunscreen saviors here.